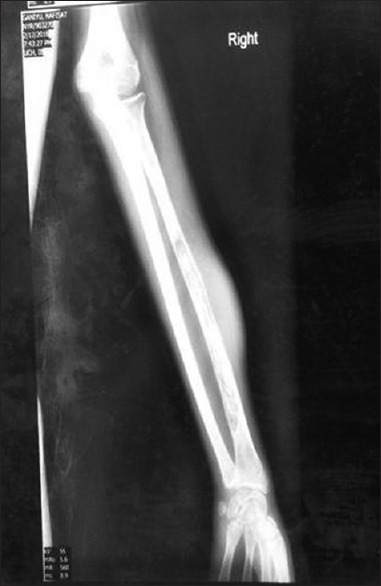 This is a case presentation of a successfully managed 18-year-old female sickle cell disease (SCD) patient with radiologically confirmed multifocal osteomyelitis with associated soft-tissue swellings and chronic leg ulcer. However, blood culture and the culture of soft tissue swellings yielded no growth of organisms, but microscopy showed numerous pus cells. The patient was not under follow-up in any hospital before presentation and freely uses off-the-counter drugs. She was transfused with 3 units of packed cells in a general hospital 6 months before presentation to our tertiary facility. Long course of potent antibiotics and surgical drainage of pus by orthopedic surgeons resulted in good outcome, and the patient is being followed up. In essence, this case has brought into the open the need for high index of suspicion, multidisciplinary approach, a need for possible sensitive serologic and molecular technique in the identification of culprit organism, and most importantly a great need for each SCD patient to submit themselves to available specialist care in their respective vicinities. Sickle cell disease (SCD) is a collective term for several genetic disorders in which hemoglobin is structurally abnormal, resulting in the episodic formation of sickle-shaped red blood cells and a wide range of clinical manifestations. Infection is a significant contributor to morbidity and mortality in SCD. It has been established that the sickle gene confers an increased susceptibility to infection and equally provokes a cascade of SCD-specific pathophysiological changes such chronic inflammation, activation of coagulation cascade, vaso-occlusion, and chronic hemolysis. Many prospective cohort studies showed that infections accounted for 20%–50% of deaths in SCD. One of the main bony complications of sickle cell anemia is osteomyelitis either acute or chronic. Osteomyelitis may result from hematogenous spread or local extension from a chronic leg ulcer. Chronic hematogenous osteomyelitis has been defined as an infection in bone, originally derived from a bacteremia or septicemia, and lasting for 3 or more months. It is associated with long-term problems such as pain, chronic sinuses and exposed bone, loss of the structural integrity of a limb, deformity, joint stiffness, and growth problems and can be very difficult to treat. This case report shows an overview of how a SCD patient with overwhelming radiologically confirmed polyostotic (multiple bones) chronic osteomyelitis presented and how the patient was successfully handled. An 18-year-old female diagnosed sickle cell anemia in childhood having presented with recurrent bone pain crisis along with a history of jaundice and need for repeated blood transfusion. The patient, diagnosed sickle cell anemia in outside facility since childhood, presented to our tertiary center with multiple painless swellings involving the right forearm/right arm and left leg of 11 months' duration. The swelling on the left leg ruptured spontaneously with emerging discharging sinuses and a chronic leg ulcer. There were also generalized bone pains, maximal at the left elbow and left shoulder joints, and infrequent low-grade fever. She had sought medical care at a general hospital 6 months earlier in respect of severe body weakness and was transfused with 3 units of blood. This was the first time to be ever admitted and transfused with blood. she was not under follow up in any hospital/clinic; instead, she uses over the counter analgesics for recurrent bone pains. There was no significant past medical history. She is the 3rd of six children in a monogamous setting. Three of her siblings, whose hemoglobin phenotypes were not determined, died of acute febrile illnesses in childhood. Both parents who are the primary caregivers are of low socioeconomic status (mother is a petty trader and father is currently unemployed). The patient is married to a photographer and had been delivered of a female infant 8 months earlier. Major findings on examination include a small for age body frame, moderate pallor, absence of jaundice and finger clubbing, slender extremities, fluctuant swelling at the proximal right arm and mid-forearm both measuring 6 cm × 3 cm each with differential warmth, tenderness, and erythema [Figure 1], a dirty ulcer on the medial aspect of the distal third of the left leg measuring 4 cm × 4 cm [Figure 2], inability to abduct the left shoulder joint beyond the horizontal plane, tachycardia (pulse was 120/min), normal blood pressure of 98/60 mmHg and normal chest, and abdominal and central nervous system findings. The initial hematocrit was 18% and repeat hemoglobin phenotype by cellulose acetate electrophoresis was HbS. A unit of packed cells was transfused at this point, and a repeat complete blood count showed hematocrit of 19%, white cell count was 7840/mm 3 with neutrophil of 70%, platelet count was 295,000/mm 3, and INR was 1.0. The outcome of further investigations revealed includes "non-reactivity to HIV 1 and2, hepatitis B surface antigen, sterile blood culture after 7 days of incubation and a urine culture that yielded no growth. 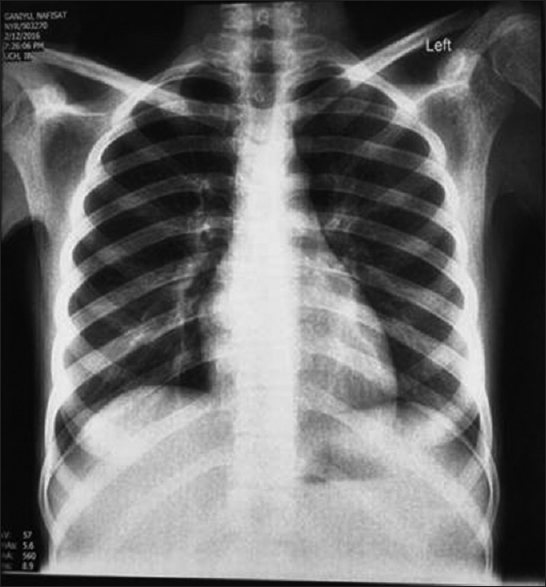 Also, the chest x-ray was essentially normal [Figure 3]. X-rays of the bony extremities showed reduction in the left shoulder joint space [Figure 4] with possible avascular necrosis of the left shoulder joint [Figure 4]. 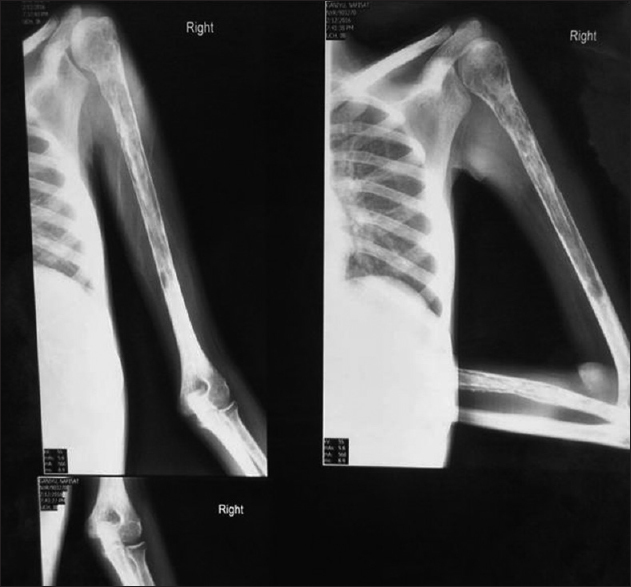 There was osteopenia at the junction of the lower 3rd, upper two 3rd distal end of the left humerus [Figure 4] and extensive osteopenia of almost the whole length of the right humerus and right radius [Figure 5]. 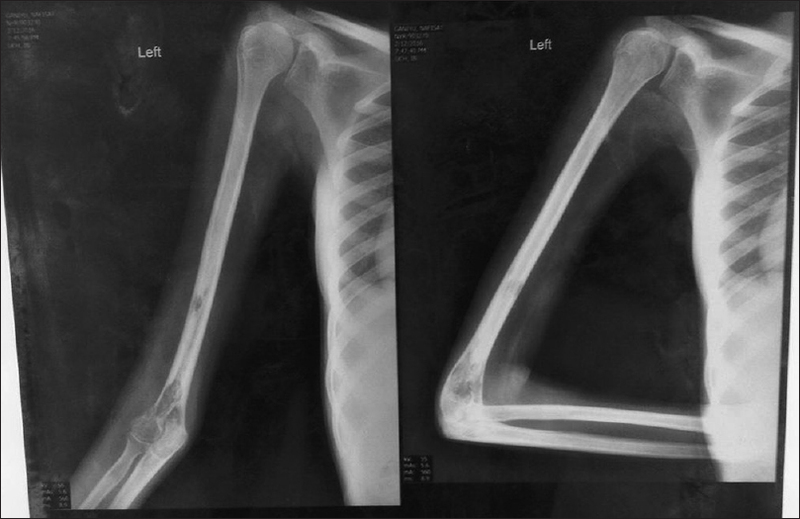 There was bone in bone appearance and soft-tissue swelling over the upper 3rd of the right arm and middle 3rd of the right forearm, in keeping with polyostotic chronic osteomyelitis [Figure 5]. Treatment applied includes intravenous antibiotics including levofloxacin and flucloxacillin. Morphia and routine drugs such as folic acid, Vitamin B complex, and paludrine were also administered. The orthopedic surgeon later carried out incision and drainage of the right upper limb swellings, and the swab of the purulent material that was cultured did not grow any pathogenic organism. A U-slab for the protection of the right upper limb was applied, and povidone-iodine dressing of the left leg ulcer was commenced. The patient is since being followed up on outpatient basis by the managing teams, i.e., hematology, orthopedics, and plastic surgery. The increased susceptibility of SCD patients to infections, including osteomyelitis, has long been recognized, and some of the recognized pathophysiological mechanisms include hyposplenism, impaired complement activity and the presence of infarcted or necrotic bone. Osteomyelitis happens to be one of the common complications of SCD and its prevalence has been found to be 12% in a study carried out in France. This study equally affirmed that the was significantly lower in the Bantu haplotype  but those with more severe haplotypes such as Benin and Senegal have increased incidence of infections. Although the haplotype of this index patient was not determine, a study determined that individuals with sickle cell anemia, possibly those with severe haplotypes, may have bilateral and symmetrical bone involvement with osteomyelitis. However, it is obvious in this index case that the patient lacked proper care. The organism responsible for this osteomyelitis in this index patient could not be determined because the blood culture and wound swab of the abscess turned out sterile. Previous suboptimal antibiotic therapy applied either at the general hospital or through off-the-counter purchase could be responsible. A common cause of osteomyelitis is Staphylococcus aureus. Salmonella spp. are recognized to be the most common causes of osteomyelitis in children with SCD., Although, even in this group of children, S. aureus remains a predominant pathogen. In a retrospective review of 167 patients in Malawi, S. aureus was the most common organism cultured from the surgical specimens.,Escherichia coli and Proteus organisms were also cultured from the surgical specimens. Bacillus subtilis was cultured only in 1% of cases. Different studies have found both S. aureus and Salmonella as the most common cause of osteomyelitis. Atkins et al., 1997, found Salmonella (especially the nontypical serotypes Salmonella typhimurium, Salmonella enteritidis, Salmonella choleraesuis, and Salmonella paratyphi B) as the most common cause, followed by S. aureus and Gram-negative enteric bacilli., Furthermore, in a review by Burnett et al. 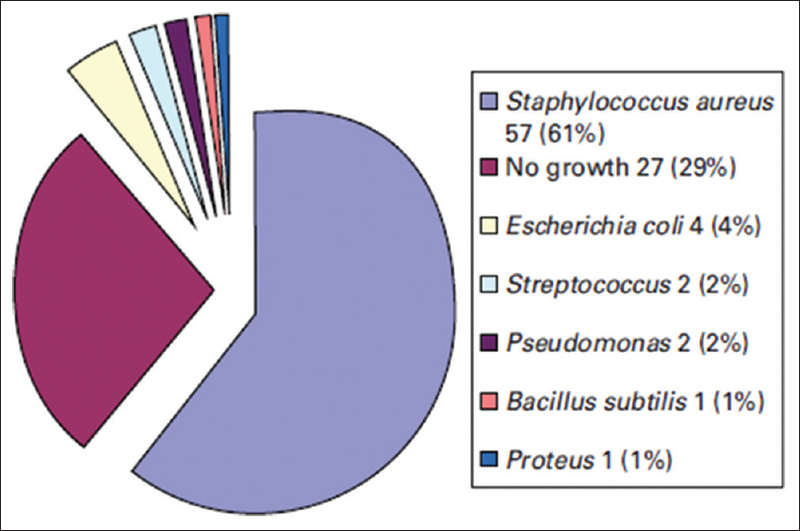 on the etiology of osteomyelitis complicating SCD, Salmonella species were the most common cause of osteomyelitis in patients with SCD worldwide. However, a local study by Aken'Ova et al. implicated that Klebsiella spp. cultured in 45% of blood samples followed by S. aureus in 20% and Salmonella spp. in 8% of 25 adult sickle cell anemia patients recruited into the study. The pathogenesis of Gram-negative enteric bacilli such as Salmonella spp. and Klebsiella spp. in the causation of osteomyelitis in SCD is that intravascular sickling of the bowel probably occurs and leads to episodes of patchy ischemic infarction and superficial devitalization of the bowel, permitting transient mucosal barrier breakdown. This the predisposes to repeated episodes of bacteremia in these patients, who may have clinical but undiagnosed Salmonella enteritis, as well as those who may have subclinical Salmonella enteric infections. This index patient had negative blood and wound swab culture. The review by Beckles et al. showed that 27% of 94 cases had negative cultures from surgical specimens [Figure 6]. In another study by Floyed and Steele, 40 of 85 patients had culture negative osteomyelitis, and such patients are less likely to have antecedent trauma but with a longer duration of pain and other symptoms. The presence of generalized osteopenia in the right humerus and radius may be due to hypertrophy of the bone marrow leading to cortical thinning and osteoporosis. Multiple bone involvement found in this patient is relatively uncommon. 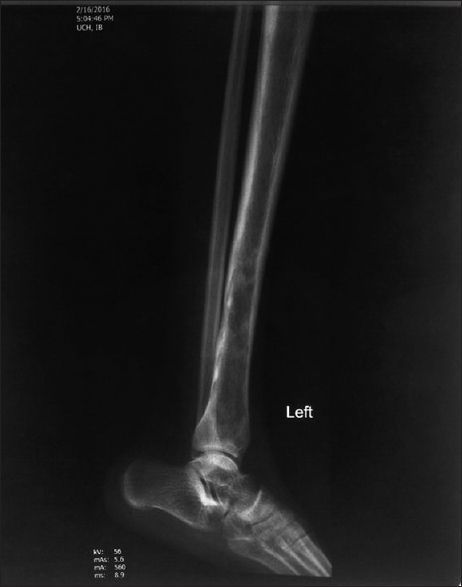 In the review by Beckles et al., only 4 of 167 children with chronic hematogenous osteomyelitis had polyostotic chronic osteomyelitis accounting for about 2.4% of the cases reviewed. Furthermore, one patient who had sickle cell trait and osteomyelitis had bilateral and symmetrical involvement of multiple bones that is characteristic of patients with severe sickle cell hemoglobinopathies. Furthermore, a review by Walter Ebong showed that 3 of 207 patients reviewed on account osteomyelitis had acute and chronic osteomyelitis involving different bones. Empirical intravenous levofloxacin and flucloxacillin were instituted in this case because our experience has shown that the combination antibiotics have been effective, especially in culture-negative osteomyelitis. Booth C, Inusa B, Obaro SK. Infection in sickle cell disease: A review. Int J Infect Dis 2010;14:e2-12. Beckles VL, Jones HW, Harrison WJ. Chronic haematogenous osteomyelitis in children: A retrospective review of 167 patients in Malawi. J Bone Joint Surg Br 2010;92:1138-43. Olaniyi JA, Alagbe AE, Olutoogun TA, Busari OE. Multiple bone and joint diseases in a Nigerian Sickle Cell Anaemia: A case report. Mediterr J Hematol Infect Dis 2012;4:e2012023. Almeida A, Roberts I. Bone involvement in sickle cell disease. Br J Haematol 2005;129:482-90. Burnett MW, Bass JW, Cook BA. Etiology of Osteomyelitis Complicating Sickle Cell Disease; Pediatrics 1998;101:2. Aken'Ova YA, Bakare RA, Okunade MA, Olaniyi J. Bacterial causes of acute osteomyelitis in sickle cell anaemia: Changing infection profile. West Afr J Med 1995;14:255-8. Floyed RL, Steele RW. Culture-negative osteomyelitis. Pediatr Infect Dis J 2003;22:731-6. Ebong WW. Acute osteomyelitis in Nigerians with sickle cell disease. Ann Rheum Dis 1986;45:911-5.